Who Wants to Be a Millionaire Play It! Take off with this Open Edition pin commemorating Mission: SPACE® Attraction at Epcot®. This pin features a sliding rocket ship. 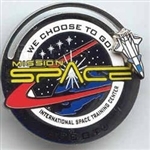 The pin reads We Choose To Go International Space Stations Training Center (Mission Space). Pin is a silver metal finish with EPCOT in black letters on the bottom portion of the pin. Disneyland 2011 Hidden Mickey Lanyard Series - World Of Color Fountain Collection features "Flower Spout" the water jet fountain. Flower Spout is grey, has long eyelashes, and is wearing a necklace. She has blue colored water projecting from the top of her head. Small Hidden Mickey head icon located in the water stream. This pin is part of the 2011 Disneyland Resort Hidden Mickey Series. Disney Trading Pin Who Wants to Be a Millionaire Play It! Shows the "Who Wants to Be a Millionaire" logo over the words "Play it!" in large yellow letters. This is a open-stock pin released at the Disney-MGM Studios to promote this new attraction. This pin features a Monorail silhouetted in dark silver/blackish metal in an orange circle. Pin is 1 & 1/4 inches diameter. Disneyland 2011 Hidden Mickey Lanyard Series - Monorails Collection features the Mark II monorail with yellow, black, and white colors with a blue windshield. Small Hidden Mickey head icon located bottom of the pin. "Go Ahead and Scream" at the sight of the Yeti on Expedition Everest™ in this Open Edition pin. This pin features a pin on pin element. The Yeti is reaching out a clawed blue hand/paw from inside a cave in the brown mountain. On a white snowbank on the bottom of the pin appears "GO AHEAD AND SCREAM" in red lettering, and "EXPEDITION EVEREST" in black letters. Remember your voyage to the stars with this Open Edition pin featuring the X-2 shuttle from the Mission: SPACE® Attraction at Epcot®. The background features stars and a white sun. The blue, white and gray X-2 shuttle is a pin-on-pin and is blasting off from the red planet, Mars. Honey, I Shrunk the Audience is one of 67 pins released as a series in 1998 (before pin trading had officially started) to commemorate some of Disneyland's favorite attractions - both present to that time and from the past. This pin commemorates the Honey, I Shrunk the Audience show, which premiered in 1998 at Disneyland (the show had originated at Walt Disney World a few years earlier). The pin shows an upright magnifying class over the phrase "I GOT SHRUNK" (the word GOT is magnified and is is blue on a yellow background...the rest of the phrase is in red on a black background). Below, on a yellow sign, are the words, "HONEY, I SHRUNK THE AUDIENCE" in red. At the bottom is the Disneyland logo. The Yeti from Expedition Everest - Legend of the Forbidden MountainTM Attraction is a cute character (Cutie) sliding down the mountain in this Open Edition pin. The mountains are blue/lavender with glitter blue snow caps. The trees are green with alternating white stripes of snow. The track is brown with blue in-between the slats on the track. The Yeti is white with blue hands and feet. A silver Guitar Pick looking pin. Has the logo to the Aerosmith Rock'n Rollercoaster on it and says DISNEY MGM-STUDIOS on it. This Open Edition pin features the logo for the Rock 'n Roller Coaster® Attraction on a guitar pick. The pick is an actual pick which can be removed to be used to play the guitar. The pin is silver but scans as black. Be careful as people trade this pin without the pick. The pick area sits on a silver area just like the pick. The Observatron is one of 67 pins released as a series in 1998 (before pin trading had officially started) to commemorate some of Disneyland's favorite attractions - both present to that time and from the past. This pin features the Observatron, a kinetic sculpture which replaced the original location of the Astro Orbitors in 1998. It is in yellow and orange with white lights beaming from it on a blue and purple background. The word OBSERVATRON is in light blue at the bottom, followed by the Disneyland logo in dark blue. This copper-finished pin measures 1 1/4" (3.2 cm) tall by 1 1/8" (2.9 cm) wide. The backstamp just says, "DISNEY." This open edition pin features the Kilimanjaro Safaris green oval attraction logo with a Rhinoceros and trees in a brown-ish silhouette color. In the background is a tan hill and a yellow sky. There is a sun that is white. 2015 Wave B Hidden Mickey for the Disneyland Resort. The rocket ship from Spaceship Earth is shown on a two-toned blue diamond. A hidden mickey is on the right side. There are two different sets of HM diamond pins celebrating DLRs 60th Anniversary (Attractions and Characters). This pin is part of a six pin set (on a hat) that is now available at Disney's Animal Kingdom. It is the third such set that the park has released. This is the Dinosaur attraction pin from the set, and it reads Dinosaur Disney's Animal Kingdom. Part of 5 Pin Set from Hollywood Studios. Shows the car from Rock 'n' Roller Coaster. This pin features Rock 'n' Roller Coaster Starring Aerosmith only from the Walt Disney World Mascot- themed mystery pack. Each pack contains 5 randomly selected pins. There are 16 pins total in the set. This pin features Dino Institute Dinos only from the Walt Disney World Mascot-themed mystery pack. The pin features a red and black dinosaur above the name. Each pack contains 5 randomly selected pins. There are 16 pins total in the set. This pin features Mani Street Electricity only from the Walt Disney World Mascot-themed mystery pack. The pin features Elliot in a green and pink circle. Each pack contains 5 randomly selected pins. There are 16 pins total in the set. This pin features Philharmagic Maestros only from the Walt Disney World Mascot-themed mystery pack. The pin features a Sorcerer Mickey dressed in a tuxedo with a yellow music note lined frame. Each pack contains 5 randomly selected pins. There are 16 pins total in the set. This pin features Midway Maniacs only from the Walt Disney World Mascot-themed mystery pack. The pin features darts, bullseyes, and shooters from the Toy Story Mania! attraction. This pin features the Thunder Mountain Boom only from the Walt Disney World Mascot-themed mystery pack. The pin features the Big Thunder Mountain Railroad train in front of the mountain above the name. This pin features the Test Track Drive only from the Walt Disney World Mascot-themed mystery pack. The pin features a Test Track car against a green and yellow background. One of four in the Fly Me to Disney Parks Booster pack. This pin is of the Jungle Cruise and features the tour boat with palm trees in the background. Red, white, blue border. This pin is from the Booster pack Fly Me to Disney Parks and features Splash Mountain. Simple mountain design with red, white and blue border. Space Mountain pin from the Booster Pack Fly Me to Disney Parks. The pin has a red, blue and white border around it. From Disney's California Adventure. Text reads "Grizzly Peak Outdoor Adventures" and shows 3-D raised hiking boots. The 200-Point pin from the "Who Wants To Be a Millionaire: Play it!" attraction at the Disney-MGM Studios. Pin is given to contestants who make it to the Hot Seat and then correctly answer the 200-point question. The purple and green with white highlights "WHO WANTS TO BE A MILLIONAIRE" logo is at top; beneath are the words "Play it!" in yellow. The point amount of 200 is at the bottom in blue; a white background is around the entire pin, which measures 1 1/2" (3.7 cm) wide by 2" (5.1 cm). The 300-Point pin from the "Who Wants To Be a Millionaire: Play it!" attraction at the Disney-MGM Studios. Pin is given to contestants who make it to the Hot Seat and then correctly answer the 300-point question. The purple and green with white highlights "WHO WANTS TO BE A MILLIONAIRE" logo is at top; beneath are the words "Play it!" in yellow. The point amount of 300 is at the bottom in blue; a white background is around the entire pin, which measures 1 1/2" (3.7 cm) wide by 2" (5.1 cm). The 500-Point pin from the "Who Wants To Be a Millionaire: Play it!" attraction at the Disney-MGM Studios. Pin is given to contestants who make it to the Hot Seat and then correctly answer the 500-point question. The purple and green with white highlights "WHO WANTS TO BE A MILLIONAIRE" logo is at top; beneath are the words "Play it!" in yellow. The point amount of 500 is at the bottom in blue; a white background is around the entire pin, which measures 1 1/2" (3.7 cm) wide by 2" (5.1 cm). The 8000-Point pin from the "Who Wants To Be a Millionaire: Play it!" attraction at the Disney-MGM Studios. Pin is given to contestants who make it to the Hot Seat and then correctly answer the 8000-point question and then doesn't lose it. The purple and green with white highlights "WHO WANTS TO BE A MILLIONAIRE" logo is at top; beneath are the words "Play it!" in yellow. The point amount of 8000 is at the bottom in blue; a white background is around the entire pin, which measures 1 1/2" (3.7 cm) wide by 2" (5.1 cm). The 1000-Point pin from the "Who Wants To Be a Millionaire: Play it!" attraction at the Disney-MGM Studios. Pin is given to contestants who make it to the Hot Seat and then correctly answer the 1000-point question. At that point, the player is guaranteed to receive at least a 5-pin set of pins and WWTBAM: Play It! ball cap. The top is purple and green with white highlights "WHO WANTS TO BE A MILLIONAIRE" logo is at top; beneath are the words "Play it!" in yellow. The point amount of 1,000 is at the bottom in blue; a white background is around the entire pin, which measures 1 1/2" (3.7 cm) wide by 2" (5.1 cm). Disneyland 2017 Hidden Mickey Wave A - Attraction Icons pin. The square pin features an orange skull wearing a pirate hat on a blue background representing Pirates of the Caribbean. A silver Hidden Mickey icon is on the lower left. Disneyland 2017 Hidden Mickey Wave A - Attraction Icons pin. The square pin features a yellow tiki face on a blue background representing the Enchanted Tiki Room. A silver Hidden Mickey icon is on the lower left. Disneyland 2017 Hidden Mickey Wave A - Attraction Icons pin. The square pin features a light blue Ezra the Hitchhiking ghost head on a blue background representing the Haunted Mansion. A silver Hidden Mickey icon is on the lower left. Disneyland 2017 Hidden Mickey Wave A - Attraction Icons pin. The square pin features the white clock face on a blue background representing it’s a small world. A silver Hidden Mickey icon is on the lower left. Disneyland 2017 Hidden Mickey Wave A - Attraction Icons pin. The square pin features a green canopied boat on a blue background representing the Jungle Cruise. A silver Hidden Mickey icon is on the lower left. This listing is for the all silver CHASER version of the Disneyland 2017 Hidden Mickey Wave A – Attraction Icons pin – Haunted Mansion. The square pin features Ezra the Hitchhiking ghost representing the Haunted Mansion. A silver Hidden Mickey icon is on the lower left. This 6 pin booster set features famous Adventureland Icons in Tsum Tsum form. This listing is for Showgirl Bird, from the Enchanted Tiki Room. She is the fancy white bird with yellow feathers. From DisneyStore.com: The collectible six-piece set includes popular characters from the Adventureland attractions reimagined as cute Tsum Tsum pins. This 6 pin booster set features famous Adventureland Icons in Tsum Tsum form. This listing is for the Jungle Cruise Skipper only. From DisneyStore.com: The collectible six-piece set includes popular characters from the Adventureland attractions reimagined as cute Tsum Tsum pins. Walt Disney World 2017 Hidden Mickey Wave A - Attraction Icons pin. The square pin features a red Dinosaur on a blue background representing the Dinosaur attraction at Animal Kingdom. A silver Hidden Mickey icon is on the lower left. Walt Disney World 2017 Hidden Mickey Wave A - Attraction Icons pin. The square pin features a blue Yeti/Abominable Snowman on a blue background representing Expedition Everest at Animal Kingdom. A silver Hidden Mickey icon is on the lower left. PinQuest at Magic Kingdom Park. The round pin has a brown outline with clues (letters and numbers) around it, it features Big Al from Big Al’s Kiosk in Frontierland. It shows a sheriff badge behind him, which you can purchase at the kiosk. Big Al also appeared at the Country Bears Jamboree before it was closed. There is a small arrow protruding from the left side of the pin. When used with the decoder lanyard medal, the pin points to coordinates on the Pinquest map to locate the coordinates of the next destination where another clue and pin can be found. There are six pins plus a completer. The back of the pin has the letter "E" which is used to unscramble a message needed to purchase the completer pin. The pin is Limited Release. This is one of four pins from the Kingdom Carousel Booster Set. This is the Candy horse. This is a pink and yellow horse decorated with lollipops and cupcakes. It has a dark pink mane, tail, and hooves. There is a light pink bow with a blue center in his mane. The horse rests on a brown pole. Part of the Fantasyland Football Mystery collection. This pin features Rafter Bear from the Grizzly River Run attraction in Disney's California Adventure. For search purposes: green, brown, gold, paddle, claws, roar, growl. Part of the Fantasyland Football Mystery collection. This pin features Pele, a tiki god from Walt Disney's Enchanted Tiki Room attraction. For search purposes: volcano, red, yellow, white, totem, voodoo. Part of the Fantasyland Football Mystery collection. This pin features Trader Sam, the shrunken head salesman from the Jungle Cruise attraction in Walt Disney World. For search purposes: evil grin, hat, earring, gold, scar. Part of the Fantasyland Football Mystery collection. This pin features the Abominable Snowman (AKA Yeti) from the Expedition Everest ride in Disney's Animal Kingdom. Part of the Fantasyland Football Mystery collection. This pin features Jingles the horse from the Fantasyland carousel. For search purposes: bells, brown, gold, mad, evil, steed, harness, white. Part of the Fantasyland Football Mystery collection. This pin features Buff, the wall-mounted Buffalo head from the Country Bears Jamboree attraction in Walt Disney World. For search purposes: For search purposes: Bison, bull, brown, white, horns, plaque, stuffed. The Disney Parks 2018 Booster Set is a 5 pin set made up of round pins featuring different Disney Park Icons. This small circular pin features the it's a small world clock face and the year 2018. The white and gold clock is on a light blue background with a dark blue outline. Enameled cloisonné, Silvertone finish, Each pin: 1 1/2'' Diameter. The Disney Parks 2018 Booster Set is a 5 pin set made up of round pins featuring different Disney Park Icons. This small circular pin features a teacup from the attraction Mad Tea Party spinning teacup ride and the year 2018. Enameled cloisonné, Silvertone finish, Each pin: 1 1/2'' Diameter. This is the pin from the “it’s a small world” Toy Shop in Fantasyland. It has an image of a hula girl and fleur de lis, with a blue border. It is part of the Pin Quest. Guests turned in purchased clue cards for pin, at specific locations. This pin features two parrots and a tiki god from the Enchanted Tiki Room Attraction at DLR. It represents the Tiki Room Harmony. Stamped on back is 2016 Disneyland parks; made in China; Mickey waffle head pattern. Each pack contains 5 randomly selected pins. There are 16 pins total in the set. Two different Disney Mascot Mystery pin sets (of 16 pins each) were released: One at DLR and one at WDW. They are inspired by artwork from March Magic 2015, which created teams and mascots based on different DLR and WDW attractions. This blue oval Fantasmic pin depicts sorcerer Mickey fighting Maleficent's dragon and says "Disney - MGM Studios" at the bottom of the pin. Black silhouette of Earful tower in a turquoise circle over dragons head. "Fantasmic!" in orange/red/blue through center of pin. Commemorate Rockin' Space Mountain in Tomorrowland at Disneyland with this Open Edition pin. This pin has a picture of Space Mountain and a Rocket with DLR 07 in the blast area. Rockin' Space Mountain is a new rock themed overlay of Space Mountain. Cosmic Waves is one of 67 pins released as a series in 1998 (before pin trading had officially started) to commemorate some of Disneyland's favorite attractions - both present to that time and from the past. The Cosmic Waves attraction, was an interactive fountain that opened in 1998. The pin - in blues and red - has a large ball in the center and two fountains of water on either side; the fountain on the right rises higher and has blasted a child (blue shorts, orange shirt) into the air. Above left is the word COSMIC in red and WAVES in purple; beneath is the Disneyland logo. This silver-finished pin measures 1 1/4" (3.2 cm) tall by 1 1/4" (3.2 cm) wide. The backstamp reads, "DISNEY." Pin is individually numbered. There were three different framed pin sets of Tommorowland attraction pins offered by the Disney Gallery around the time that Tomorrowland was "updated" to its present configuration. This pin is part of the Disney Parks Attractions Mystery Box Set #115785. The pin features the Abominable Snowman from the Matterhorn Bobsleds (DLR) / Expedition Everest (WDW) with his arms up, roaring, with red eyes. He is surrounded by brown stalagmites. He is on a light blue background. Swiss Alps from the Soarin' Around the World Mystery Collection. Pin is 1 1/2 x 1 inches; silver metal. A thin band of red and silver surround this pin. There is a red ski lift/tram going up beside a snow capped mountain. Pine trees are in the foreground of the pin. At the top, in the sky, the words Swiss Alps are written in black cursive. The collection was released to celebrate the Grand Opening of the "new" Soarin' Around the World attraction at both Disney's California Adventure and Walt Disney World Epcot. This pin is shared between both parks. Each box contains two randomly selected pins. There are nine pins in the collection. This listing is for the Monorail pin from the "Cars Attraction Posters" booster set (82956). Pin features a red and white "Cars"-like Monorail on the vintage Disneyland Monorail System attraction poster. Matterhorn Mountain is in the background of the pin. This is Chicken #4 from the WDI - Goofy's Sky School Chickens set of 5, #87621. This chicken is sitting on a nest while wearing an aviator's helmet and goggles. The Russian Boy has yellow hair and is wearing black pants, a white shirt with a yellow vest, pink belt and boots, and a black hat. His arms are outstretched and he appears to be dancing. He's standing among some blue flowers. Girl from Hawaii has black hair, wearing a blue hula skirt with red and yellow leis, she has a red flower on the right side of her head. Her arms are outstretched, and she's standing among some blue & red flowers. This American Cowboy is blonde and wearing a darker yellow cowboy hat. His shirt is turquoise, his pants are dark blue and his vest and cowboy boots are the same dark yellow as his hat. At each side of him is a yellow flower with 5 petals and a dark blue center that matches his pants. His neckerchief is red, his eyes are silver dots. The Dutch Girl has yellow hair and is wearing a blue dress with white sleeves, yellow clogs, and a white hat. Her arms are outstretched and she's standing in front of two pink hearts. Walt Disney World 2017 Hidden Mickey Wave A - Attraction Icons pin. The square pin features a blue Dumbo head on a blue background representing the Dumbo the Flying Elephant attraction at Magic Kingdom. A silver Hidden Mickey icon is on the lower left. Walt Disney World 2017 Hidden Mickey Wave A - Attraction Icons pin. The square pin features a light blue diamond and pickaxe on a blue background representing the Seven Dwarfs Mine Train attraction at Magic Kingdom. A silver Hidden Mickey icon is on the lower left. Walt Disney World 2017 Hidden Mickey Wave A - Attraction Icons pin. The square pin features a purple Figment head on a blue background representing the Journey into Imagination attraction at Epcot. A silver Hidden Mickey icon is on the lower left. From set 67579. Disney Characters from both films and theme parks are featured on coins in this Mystery Pin Collection. This pin features the Yeti from Expedition Everest and is only available in the Walt Disney World® Resort Coins - Mystery Pin Collection. From set # 108149. Here we have a child of the far north, dressed in yellow, orange, red, black and brown. He is smiling and he needs that parka to keep him warm in the weather that he must endure. He is beside a structure which is red, blue and white. This pin is part of the parade set that commemorates the 45th anniversary of Disneyland. This pin shows a woman in a flamingo like costume with wings. The flamingo has a yo yo (yoyo) coming from one of its wings, similar to the one coming from the bird in the Fantasia 2000 segment. Phantom Boats is one of 67 pins released as a series in 1998 (before pin trading had officially started) to commemorate some of Disneyland's favorite attractions - both present to that time and from the past. This pin features the Phantom Boats, small motorboats that were formerly in Tomorrowland. The pin is in blues, with a boat and three guests/3 people shown waving, traveling far faster than the actual boats went. PHANTOM BOATS is in blue on a pale yellow background, with the Disneyland logo beneath. This silver-finished pin measures 1 1/4" (3.2 cm) tall by 1 5/16" (3.3 cm) wide. The backstamp reads, "DISNEY." One of the eight mystery pins from the Kingdom of Cute Mystery Collection. Search purposes: white building, dome roof, spiral roof, smiling face. One of the eight mystery pins from the Kingdom of Cute Mystery Collection. This one features a cute version of The Sword in the Stone, Excalibur. Search purposes: rock face, anvil. One of the eight mystery pins in the Kingdom of Cute Mystery Collection. This one features a ship or boat from the Jungle Cruise ride. There is a striped top and a smiling face on the boat. One of the eight mystery pins from the Kingdom of Cute Mystery Collection. This one features a cute, grey black gargoyle candelabra from the Haunted Mansion ride. Search purposes: gremlin, light, candle holder. This pin depicts the Disney Hollywood Studios ride the Rock 'n' Roller Coaster. It is pink with pearlized pink swirls and 6 clear gems. There are 2 lavender crossed guitars above a blue car similar to those on the ride. The name of the ride is in white above the car. This is the GM (General Motors) press pin given out for the opening of Innoventions. Each press pin has one of the companies who sponsored a part of innoventions. Three part dangle pin handed out at a press only event at Walt Disney World for the opening of the remodeled Innoventions and the beginning of the 2000 Celebration. The top section reads "G M". The middle brass colored bar reads "at INNOVENTIONS" and the bottom features the WDW 2000 logo "Walt Disney World Celebrate the Future Hand in Hand." Part of series representing the different vendors at Innoventions. Later offered as a premium with purchase from the Disney Store online in a promotion that ended 1/31/2000. This pin has no backstamp whatsoever. This is because the Disney Copyright is on the front of the pin. This pin is of a Test Track Holographic Ride Vehicle. It is blue white and red car from the ride found at Epcot. This pin is one of eight in the second Kingdom of Cute set. It features the House of the Future that used to be in Tomorrowland in Disneyland. This pin pays tribute to Hollywood Studios' Rock N' Roller Coaster. The ride's car is racing along a curved track which looks like a guitar on top. the words I Conquered are large in yellow against the otherwise blue and purple toned pin. This pin shows Mickey, Donald and Goofy riding in a Simcar on the “Test Track” attraction at Epcot in Walt Disney World. The pin on pin features the attractions logo with the sponsor, Chevrolet. The Chevrolet logo is also featured on the Simcar itself. The Flying Saucers ride is one of 67 pins released as a series in 1998 (before pin trading had officially started) to commemorate some of Disneyland's favorite attractions - both present to that time and from the past. This pin features a green and white Flying Saucers vehicle, with a Guest dressed in orange and green inside. FLYING SAUCERS is at the top with the Disneyland logo at the bottom. The short-lived attraction from the 1960s featured bumper car-like hover crafts. nspired by the Rock 'N Roller Coaster® Attraction, get your backstage pass to the "Rock This Way" tour with this open edition pin. Aerosmith is written on the pin in psychedelic blue and purple lettering, with guitars and skulls. Also says PROPERTY OF AEROSMITH MANAGEMENT on the bottom. This pin is similar to pin pics # 177 except the pin is blank where the Scimitar Oryx should be. It's a Small World - Repeat, Repeat, Repeat! Mickey is wearing an aviator's hat, googles, and a brown leather bomber jacket. In a gold bronze colored text is printed Soarin' Around The World at the bottom of the pin. In the upper right corner of the pin it says King Of The Skies. 133424 It's a Small World - Repeat, Repeat, Repeat! The ninth pin in the series, for "and a smile means friendship to everyone," shows a pair of monkeys from the attraction. They are hugging each other behind a large green leaf. In the background is an orange and yellow sun. The final pin in the series, for "It's a Small World After All," shows six children of the World, wearing their national costumes, in a blue boat. Behind them are flags of the US, Japan, Mexico, Puerto Rico, France, Canada, Ethiopia and the UK. The pin was designed by Ralph Kent. This listing is for the Innoventions pin ONLY from the limited release reveal/conceal Epcot 30th mystery collection (#94523). This pin features Tom Morrow 2.0, the attraction's yellow and grey robot mascot, waving his hand in front of a black background. This listing is for the Red Car Trolley pin from the open edition 2013 Annual Passholder - Tour the Lore of Disneyland® Resort (#94357). This sculpted metal pin features the Red Car Trolley. The pin has the Red Car Trolley attraction logo. This pin is a red color metal. This listing is for the Double Decker Bus pin ONLY from the limited release reveal/conceal Epcot 30th mystery collection (#94523). This pin features Mickey Mouse in a tuxedo and presenting the World Showcase Bus. The bus is red and has flags of the countries on it - Japan, China, and Italy. This listing is for the Casey Jr. Splash 'N' Soak Station pin ONLY from the open edition Annual Passholder - New Fantasyland Set collection (#94194). This pin features Casey Jr. the train from Dumbo. Casey Jr. is made of a blue colored sculpted metal. The stained glass behind Casey Jr. is blue, green, and red and features railroad tracks and mountains. Astro Orbitor is one of 67 pins released as a series in 1998 (before pin trading had officially started) to commemorate some of Disneyland's favorite attractions - both present to that time and from the past. The Astro Orbitors had been around for a while, but were relocated in 1998. The yellow with blue, red and pink vehicle faces right and has two Guests in it. There is a dark blue background with Saturn in yellow and another planet. The Disneyland logo in white and words ASTRO ORBITOR in blue are at the top. At the bottom is the date 1998 in pink. The copper-finished pin measures 1 1/2" (3.8 cm) tall by 1 1/2" (3.8 cm) wide. this pin was 1 of 3 issued on July 15,2000 to celebrate the 45th Anniversary parade. This is the Russian Thistle dancer from Fantasia. Disneyland 45 Years of Magic Parade. The Teacup from the Kingdom of Cute Mystery Collection Search purposes: yellow, golden, gold, white stripe, smiling face, saucer, orange handle. Part of the 15 pin series to commemorate the 20th Anniversary of WDW, this circular pin has an inner circle with Big Al and a pine tree on either side of him. This pin is one of eight in the second Kingdom of Cute set. It features the grey submarine from 20,000 leagues under the sea. This pin is one of eight in the second Kingdom of Cute set. It features the Yeti from the Matterhorn ride. He stands with his arms raised with a blue face and hands. This pin is one of eight in the second Kingdom of Cute set. It features Sam Eagle from America Sings. He is wearing an Uncle Sam style red and white striped hat. One of four Sounds of the Season Pins featuring Fritz, (pin on pin), the red and white parrot host, from The Enchanted Tiki Room. He wears a Santa hat and is surrounded by poinsettias and Christmas lights. There is a translucent blue background behind him and below him, a nameplate with his name Fritz and the words: Sounds of the Season in red with holly. This was part of a series of pins sold during the 20th anniversary of WDW in 1991. Each was a small circular pin. This one has the robot-like character seen at the beginning of the nighttime parade. Pin showcasing the Mark Twain Riverboat attraction at Tokyo Disneyland. This is the final pin in this Disneyland® Resort Annual Passholders 4 (four) pin set. Each quarterly released pin is a different faux stained glass puzzle piece, which forms the picture that appears on the card backing when all 4 puzzle pieces are put together . The November pin features the Fun Wheel from Disney’s California Adventure Park. This pin is part of the Disneyland Parade of Stars series. It is a grey (gray) centaurette that faces left with gold colored hair and 2 gold colored snakes in her hands. This listing is for the Test Track pin ONLY from the limited release reveal/conceal Epcot 30th mystery collection (#94523). From the classic attraction Jungle Cruise at WDW Adventureland we have Goofy as Chief Nami offering two of his heads for one of yours. Goofy is standing on the shores of the Jungle Cruise with a Jungle Cruise ship in the background. Goofy's umbrella has a movement element to it, it can move left and right. This scene is framed within a ship's wheel. There is also a dangle elements that hang off of the ship's wheel, another ship's wheel that says "Nile Nellie" on it next to a tribesmen shield. . On the back of the pin it has a gold colored Mickey waffle Pattern with two pin posts side by side both have no nubs. The upper portion of the pin has the WDW 45 Anniversary logo next to the OPT 2017 logo. The lower portion bottom left has the Disney Made in China copyrights. Underneath that has Limited Edition of 3000. This listing is for the Flying Saucers pin from the limited edition Sci-Fi Academy mystery collection (#83293). This limited edition mystery collection features Disney Movies and Attractions as old retro video games. This Video Game is orange and says "Flying Saucers" at the top and features a screenshot of the game in the middle. The screenshot is a raised photo element. The player scores are 6 and 1 - a reference to the attraction's opening year of 1961. This listing is for the Astro Jets pin from the limited edition Sci-Fi Academy mystery collection (#83293). This limited edition mystery collection features Disney Movies and Attractions as old retro video games. This Video Game is blue and says "Astro Jets" at the top and features a screenshot of the game in the middle. The screenshot is a raised photo element. The player's score is 1956 - a reference to the attraction's opening year. This dining pin was limited to Annual Passholders who made single food purchases of $30 or more (before tax and after discounts) at selected restaurants throughout DLR. This is pin number 6 in the "Five Decades of Disney Dining" series available to Annual Passholders. The copy on the inside of the box reads: This quaint refreshment location came out of hi-bear-nation and debuted to guests visiting Bear Country in 1972. An ingenious use of mirrors made the bar seem to stretch as far as a country mile, resulting in the bar's whimsical name. Walt Disney World was actually the first Disney Theme Park to feature the Mile Long Bar located in Frontierland of the Magic Kingdom. In 1989, Splash Mountain made it's "splashy" debut and soon guests were journeying through the world of Brer Bear, Brer Fox and Brer Rabbit in hopes of finding the secret "Laughing Place." To go along with the new attraction, the Mile Long Bar was renamed the "Brer Bar". Guests who were drenched on Splash Mountain could stroll across the way to Brer Bar and becomes quenched with light fare and cool drinks. Pin image shows Country Bears Zeke and Tennessee holding a huge hotdog in front of a window with green curtains/drapes and metallic blue sky. The "MILE LONG BAR" sign is on the bottom. Pin size is 1 5/8 inches by 1 3/4 inches. Diamond Decades Collection - Grizzly River Run featuring Mickey, Grizzly Bear, and Pluto going for a wild and crazy ride through Grizzly River. The D60 logo is featured on the bottom left of the pin. This pin is a Limited Edition 3,000. Take a trip through the history of Disneyland® Attractions in this pin-of-the-month series! This pin features the Flying Saucers Attraction which was replaced by the Space Mountain Attraction at Disneyland® Park. The pin spins to reveal both attractions, with the original attraction in metal and the current attraction in full color. On the Space Mountain side, Pluto is dressed as an astronaut with a helmet. The sixth pin in the series, for "that it's time we're aware," shows the White Rabbit from "Alice in Wonderland." He's wearing a red coat and holding an umbrella and a large gold pocket watch. He's standing in a graphic red, green and teal background. The pin is designed and signed by John Trent. The excitement of the "Piece of Disney History" continues in 2010 at the Disneyland® Resort! Featuring actual pieces from historic attractions, this special March 2010 pin features Dinosaur Jack's Sunglass Shack at Disney's California Adventure® Park. Each pin contains actual pieces of the iconic dinosaur Dino Jack himself! This pin is from the Piece of Walt Disney World® Resort History Pin Collection. This delightful limited edition pin contains a piece of the fabric from The Big Bad Wolf's, from The 3 Little Pigs, costume worn in the Spectromagic parade in the Magic Kingdom® Park. This unique pin features pin-on-pin, stone application, and glitter fill embellishments. This pin is part of the Diamond Decades Collection. The pin commemorates Matterhorn Bobsleds at Disneyland Park. It features Mickey and Pluto skiing down the face of the Matterhorn. The pin opens, in the middle, to reveal the Abominable Snowman. The 60th Diamond logo is at the bottom of the pin. This is a round, silver logo pin embossed with Walter & Co. Quality Steam Engines. This is one of two LE 500 chasers. This pin is part of the DLR Twenty Eight & Main Limited Release Mystery Collection (#123831) made up of 8 Limited Release pins and 2 Limited Edition Chasers. Each of the chasers is LE 500. The set features pins of different attractions and locations at Disneyland. The DLR box is Dark blue with a brown center with the pin name in white. Each box contains two randomly selected pins. A similar set was released at WDW. This is a brown pin of an old British explorer with a long white moustache, wearing a monocle. He's a fortune telling machine located in the South Sea Traders in Adventureland at Disneyland park. He is a shrunken head that diagnoses illnesses and gives a small souvenir card. This pin is part of the DLR Twenty Eight & Main Limited Release Mystery Collection (#123831) made up of 8 Limited Release pins and 2 Limited Edition Chasers. Each of the chasers is LE 500. The set features pins of different attractions and locations at Disneyland. The DLR box is Dark blue with a brown center with the pin name in white. Each box contains two randomly selected pins. A similar set was released at WDW. The Disneyland® "Skyway to Tomorrow" was the inspiration for Monorail Café, the popular Disneyland® Hotel eatery that closed its doors over a half-decade ago to make way for Disneyland® Resort expansion and the Downtown Disney® District. Between 1955 and 1999, Disneyland® Monorails streamed quietly above Monorail Café while diner Guests enjoyed the tasty fare of this classic American malt shop, where cheeseburgers, fries and shakes were the enduring staples. We take you back to this bygone landmark in the form of our fifth commemorative pin in the Classic Restaurant series of 2004 Dining Pins. This hinged pin features attributes of Space Mountain. On the front are pictures of a Space Mountain and a Ride Vehicle on a track. On the inside is Space Mountain's Attraction's host costume, in grays and black. As part of the Happiest Celebration on Earth, Epcot® is opening Soarin'. Walt Disney World Passholders can purchase this exclusive Limited Edition pin. The pin celebrates the opening of Soarin' at Epcot® and is dated 2005. Pin has square bottom with rounded top arch which takes the shape of a banner. Across arch are the words OPENING DAY and 2005 with red arrows pointing to the 2005. On the left are a bank of tall green pine trees set in front of a gray mountain range. Word "Soarin'" is written in blue italic above small gold/yellow "Walt Disney World" logo and yellow arch. Flying above the arch is a dangling hang glider piloted by a very happy Mickey Mouse who is smiling as he looks upon the wonders of California. Disney Design Group Artist Angela Connolly designed this pin. 60th Diamond Celebration Mystery Puzzle Boxes Series One. Eight revealed pins limited edition of 550 each with two chasers limited edition of 300 each. This pin features the Yeti in greyscale with a blue border on the side of the pin. This limited edition pin of the month series features the poster designs from Walt Disney World ® Resort attractions. This pin includes the poster of Walt Disney World ® Resort attraction, Grand Prix Raceway, and opens to reveal Chip and Dale. The inside resembles a caution road sign. The sign is yellow and black and reads "Do Not Bump Car In Front". Chip and Dale are in silhouette form riding in cars. A gold Cinderella Castle is sculpted on the inside of the hinged poster. This pin of the month series features the poster designs from Disneyland® Attractions. This pin includes the poster of Disneyland® Resort Railroad and opens to reveal Goofy with a train engine. Goofy is dressed as a train engineer. A gold Sleeping Beauty Castle is sculpted on the inside of the hinged poster. This pin is from the Piece of Walt Disney World® Resort History Pin Collection. This delightful limited edition pin contains a piece of the accessories worn by the ostrich in the SpectroMagic parade in the Magic Kingdom® Park. This unique pin features pin-on-pin, stone application, and glitter fill embellishments. This listing is for the Pin Trading Board Game Grizzly River Run Completer Pin released at the 60th Anniversary event at DLR. Four completer pins have been released for use with the Pin Trading Board game (#109…). Completer pins feature the opening date for the attraction in screen print with translucent fill for the diamond-facets in the design. Completer Pins include: Grizzly River Run (#109174), It’s a Small World (109…), Sleeping Beauty Castle (109…), and Space Mountain (109…). Token pins available include: Aurora, Genie, Mickey Mouse, Donald Duck, Minnie Mouse, and Mr. Toad. Designed by Quynh Kimball. This pin is part of the Diamond Decades Collection. The pin features Minnie and Mickey sitting in the Storybook Land Canal Boats. This Pin-on-Pin Passholder exclusive celebration of the return of Fantasmic! to the Rivers of America is purple, silver and black image of Maleficent as a Dragon with a second pin of Sorcerer Mickey standing on the FANTASMIC! Logo also in purple outlined with silver added on the lower front. In the lower right corner of the main pin is DISNEYLAND Resort in purple. The back of the pin has the Mickey Icon stamped pattern with one pin and one nib near the top Below the pin on the left is the box with the OPTL and next to that on the right is a circle with a profile of Mickey and the words Disneyland Resort PASSHOLDER. Below these boxes is a rectangle with Limited Edition of 2500 between the rivet heads from the pin-on-pin element and below that is the Disney copyright and made in China box. The FAC code is vertical in ink on the far right. This pin is one of four Season's Eatings 2017 gingerbread style cookie pins. This pin features the Matterhorn's Yeti. He is a cut-out cookie free-d element on a pastel Pink and Red "plate" that is decorated with red cross shields, and star shaped snowflakes. It also reads Season's Eatings 2017 on the top left and Disneyland Resort on the bottom right. The back of the pin is silver toned. There are also two horizontal posts with no nubs towards the top/edges. The waffle print mostly runs off the edge, it is irregular in some areas. There are also four centered boxes. The first is the pin trading logo. The second reads Limited Edition of 3000(the space between "of" and "3000" is not as prominent). The third box has the factory number FAC-041729-17118. The last box reads (C)DISNEY, MADE IN CHINA. *Some have an excess of glue surrounding the free-d element. Disney artists capture their first Disney memories in the Disney Dreams collection. This pin collection will feature specially decorated Mickey Mouse icons. This design is a salute to some of the most popular attractions at Disneyland® Park. The pin features the Hitchhiking Ghosts in front of The Haunted Mansion®, the runaway mine train at Big Thunder Mountain Railroad (pin-on-pin), an intergalactic rocket in front of Space Mountain, and a bobsled careening down the majestic Matterhorn at Matterhorn Bobsleds. Size: approx. 1 3/4" H x 1 3/4" W.
This listing is for the Space Mountain pin from the limited edition Sci-Fi Academy mystery collection (#83293). This limited edition mystery collection features Disney Movies and Attractions as old retro video games. This Video Game is red and says "Space Mountain" at the top and features a screenshot of the game in the middle. The screenshot is a raised photo element. The game's level and player score is 5 and 2,777 - a reference to the attraction's opening year at Disneyland, May 27, 1977. This pin is an exact replica of a virtual pin that players can wear and trade in VMK. The names given to these real pins correlate to the pin names within VMK. Virtual Magic Kingdom (VMK) Pins in this series are: 60037, 60038, 60039. This is the first pin in the monthly Crests of the Kingdom collection at Disneyland! It is a Pewter looking hinged pin with the Crest of Toad Hall with the words Toadi Acceleratio across the bottom and when you open it there is a shield shaped color image of Mr. Toad driving a red car (ride vehicle) with Toady in the hood. The back of the pin is the Mickey Icon waffle pattern with two pins centered top and bottom and four boxes between. On the left is the ODPT stamp with the copyright box on the right above the FAC box and below all of that is the box with Limited Edition of 2000. This silver, metal hinged pin shows the three birds from The Enchanted Tiki room embossed on the front cover. Two are cockatoos and one is a parrot. Three words are also embossed on the crest: Cantabo, Latin for sing; Aves, Spanish for birds; and Tropicae, Latin for tropical. The pin opens up to reveal a white cockatoo sitting on a ring and a blue and gold parrot wearing a hat. Magic of Honor Enchanted Tiki Room pin of the Month January 2019 Walt Disney World Exclusive. Magic of Honor is embossed at the top of the pin holding the ribbon that is green with an orange stripe. The medal itself is of the Parrots and Birds on rings from the Attraction. Enchanted Tiki Room is embossed at the bottom of the pin. Jose' the macaw is in the center with his hat and cane. Diamond Decades Collection - Fantasmic Pin, this Diamond Decades hinged pin features Fantasmic! Mickey is wearing his sorcerers hat, on the top of the diamond is Dragon Maleficent, and the hinged portions are Dragon Maleficent wings. This is a Limited Edition 3,000. This pin is pin number 4 out of 20 in the Dave Smith Collection Dave Smith, director of the Walt Disney Company Archives and long-time Disney Historian (and good personal friend), has selected the top 20 moments in Disney Theme Park History. This pin celebrates the classic Disney attraction - it's a small world. This Limited Edition spinner pin features dolls from the "it's a small world" attraction. The "Dave Smith Medallion" is a dangle. Susana Diercks from Disney Design Group created the artwork for this pin. Dave says, "It's a Small World opened at Disneyland® Park on May 28, 1966 after entertaining millions for two years at the New York World's Fair."